Aszure Barton and Artists’ Boston debut will include “Busk,” a look at what drives performers. NEW YORK - Less than 24 hours before a performance, choreographer Aszure Barton is making changes to her work. “I’m not going to have Andrew in this section anymore,’’ she announces from a seat in the audience at LaGuardia Performing Arts Center in Queens. Her long, lithe legs hang over the back of the chair in front of her. It’s a late-night technical rehearsal, and in addition to figuring out spacing on an unfamiliar stage, she’s having her dancers memorize new counts, entrances, and exits. But these modifications don’t come from insecurity or indecision; they are a core part of Barton’s choreographic process. 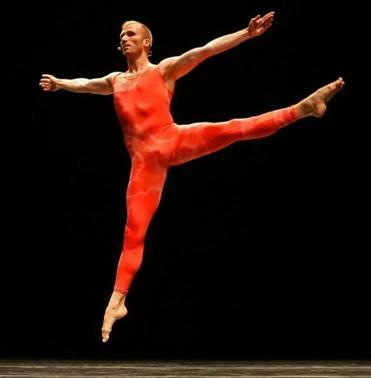 Barton (above) is a protégée of Mikhail Baryshnikov. At 36, Barton is one of the world’s most promising contemporary dance-makers. She has created works for American Ballet Theatre, Nederlands Dans Theater, the Martha Graham Dance Company, and Hubbard Street Dance Chicago, among many others; has choreographed for Broadway and film; and directs her own New York-based troupe. Tonight and tomorrow, at the Tsai Performance Center, Aszure Barton and Artists will make their Boston debut. Presented by the Celebrity Series of Boston, the program includes “Blue Soup’’ - which the choreographer describes as an “energetic taste of who I really am’’ - and “Busk,’’ a dramatic and often comedic look at what drives performers. Others have also called him conceptual, experimental, cerebral, and controversial as he has risen from the fringes of the French dance world. Ultimately that instinct won out. After five years dancing professionally, Barton began submitting pieces to festivals and competitions. Almost instantly, her choreography caught critics’ and artistic directors’ attention. Her big break came in 2003, when she met Mikhail Baryshnikov at a post-performance cocktail party. He had heard about her from members of his White Oak Dance Project and expressed interest in her work. Two years later, just as big-name commissions were beginning to roll in, Barton received a call from the Baryshnikov Arts Center in Manhattan, inviting her to be its first artist in residence. That was the beginning of a close creative relationship with the ballet luminary. Baryshnikov became Barton’s mentor and eventually suggested she create a piece on him. “That’s not something I ever thought I’d be asked to do. I mean, jeepers,’’ she said with a laugh. Her time at the Baryshnikov Arts Center led to another serendipitous encounter, this one with the director Scott Elliott. He was looking for a choreographer for his 2006 Broadway revival of “The Threepenny Opera’’ and, after sitting in on Barton’s rehearsal, hired her on the spot. She’s also adding layers to her work. Barton has a gift for integrating complex structured sequences and quiet emotional moments. She elevates subtle gestures, like the fluttering of fingertips, into expressions of profound beauty. While her movement style is rooted in the classical tradition and her dancers are adroit technicians, she doesn’t feel a need to conform to any vocabulary. “I have a huge respect for formalism in ballet. But what I love about what I get to do is trying new things all the time,’’ she said. That includes trying new things the night before a show. “It’s extremely mentally taxing,’’ admitted Benjamin Wardell, a dancer in her company. But the intellectual exercise is part of what attracted him to Barton’s work. “Her process is an ever-changing puzzle you have to keep up with. A lot of choreographers set something and then drill it over and over again. But for her, that makes a piece lose its freshness.’’ Barton’s constant tinkering imbues her dances with a dynamic raw energy. Elaine Stuart can be reached at elainecstuart@gmail.com.